The board fits on the most common C64 mainboard models, namely 250407, 250425, 250466 (breadbox) and 250469 (flat case). The board and component dimensions were carefully chosen to allow installation in either flat or breadbox type C64 cases. 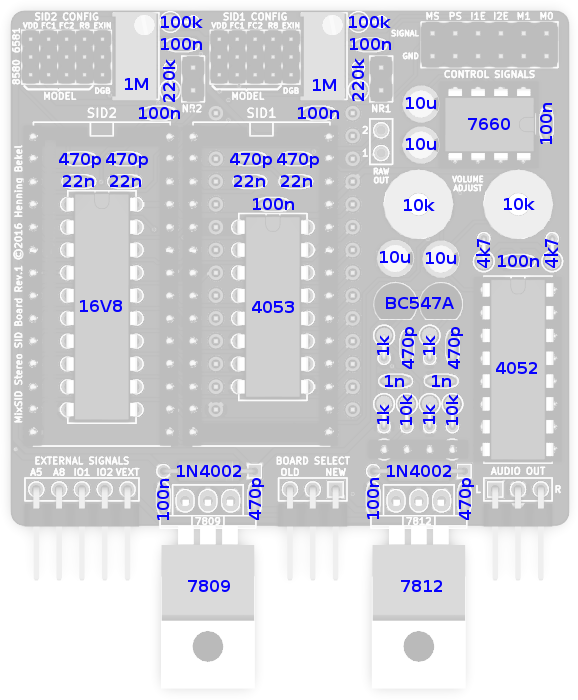 Both +12V and +9V can be generated directly on the board, making the choice of SID models independent from the C64 mainboard. On older mainboards, the +12V provided at the SID socket are used to generate the +9V for the 8580. On the later 250469 mainboard both voltages are generated from the +20V available at the cathode lead of CR3. Jumpers are used to configure the SID model and mainboard type, making it easy to use the same build on different mainboards and with different SIDs. There is no need to settle for a specific setup at build time. The integrated channel mixer controls which SID output appears on which stereo output channel. Listen to a single SID in mono, or listen to both SIDs in stereo. There are only two major modes controlling the address of the second SID. In parallel mode, both SIDs appear the standard address range starting at $D400. When a mono tune is played, both SIDs will play the same. In stereo mode, the secondary SID listens on all addresses which are commonly used by stereo tunes at the same time, namely on $D420 and $D500, and optionally also on $DE00 and/or $DF00. This frees the user from having to care for the specific stereo address expected by a certain stereo tune. All that is necessary is to switch to stereo mode. It is possible to virtually swap the roles of the SIDs in terms of addressing for stereo tunes, i.e. to control which SID should stay at $D400 (primary) and which SID should move to the stereo addresses (secondary). Stereo tunes written for a mix of SID models may expect either model as the primary SID, so this feature makes it possible to listen to these tunes as intended, without having to physically swap SIDs in their sockets. You can control which SID responds to read requests even if both SIDs are addressed in parallel at $D400. Only the primary SID will thus respond SID detection attempts by software. The user may permanently connect the I/O1 and I/O2 lines from the C64 mainboard and still control at runtime whether or not the secondary SID should actually appear at the corresponding addresses $DE00 and/or $DF00 when in stereo addressing mode. This makes it trivial to avoid conflicts with expansion port modules using the same address ranges. Paddles and mice just work regardless of the current runtime configuration. When addressed in parallel at $D400, only the primary SID will respond to read requests, while the secondary SID is forced write-only. In addition, the POTX and POTY lines are multiplexed to whichever SID is currently configured as the primary SID, so that switching SID priority won't affect paddle function either. For each SID a dedicated output circuit is integrated on board to achieve independence from the variant used on the current C64 mainboard. The output circuits are identical to the circuit used on the 250469 model, with variations for different SID models (R8) taken into account. Both output signals will end up at a dedicated stereo output after mixing. The board includes all circuity necessary to either boost the 8580 sample volume, use audio-in features of the SIDs or reduce noise by grounding audio-in. Since different models and SID chips may produce different output levels, the board includes individual volume adjustment pots for each SID. It is also possible to additionally route the audio output to the existing output circuit on the mainboard, so that sound will also end up at the A/V connector and as part of the composite signal. The user may either settle on one of the two SIDs or decide to mix down both signals to mono (although the latter option will introduce some crosstalk). Apart from the power supply and model settings, all runtime features are optional, and sensible settings are used as defaults. For example, if no other external or control signals are connected, the second sid is addressed in parallel to the first, and both appear on separate stereo channels by default. If the user wishes to listen to some stereo tunes, A5 and A8 need to be connected, and the MODE SELECT control signal (MS) can be used to switch between addressing modes. If the user wishes to listen to the individual SID outputs as well, the M0 and M1 signals can be used to control the channel mixer, and so on. All runtime features are controlled by 5V logic signals. These signals are driven high when not connected, so they can be controlled by either leaving them open or simply connecting them to ground. Thus simple jumpers or switches can be used as well as external logic signals. This makes the MixSID suitable for simple means of control, but also allows it to be controlled by more sophisticated devices such as the keyman64. No attempt is made to free you from the responsibility of using the proper configuration for your SID chips. You, and only you, configure the mainboard type, the supply voltage, filter caps and output circuit resistors via physical jumpers. In order to help you take this responsibility, this project strives to deliver complete and extensive documentation. The board has been designed to be easy to produce and to be assembled by hand, using only low-tech components in through-hole packages. Gerber files are provided that can be send to any board house for production. All source and design files are published and can be used freely under the terms of the GNU General Public License Version 2. The source distribution includes the source for the 16V8GAL logic as well as schematics and pcb layouts in KiCad format. I’m offering assembly kits including the MixSID pcb, preprogrammed GAL and all required components (except connection cables and SID chips) for 25€ each. Worldwide shipping via regular mail is free of charge. To place an order, please include the word “MixSID” in the subject. State your full name, your complete international shipping address and the number of kits you wish to buy. Note that orders are limited to a maximum of two kits per person. You will receive an email containing payment information (bank transfer only). You will have to pay in advance to confirm your order. The board has been confirmed to fit and work properly on 250407, 250425, 250466, and 250469 mainboards. It probably won’t fit on the early 326298 and KU14194HB models, it may fit into an SX64. Note that the MixSID has not been tested on the latter mainboards/machines, so your mileage may vary. If you choose to try and install on one of these, please feed back your results. When installing on a mainboard on which the SID socket is located near the top edge, the MixSID board will partially hover above the CPU. If the CPU sits in a socket itself, another socket in between the SID socket and the MixSID board is required to lift it above the CPU. If you want to use coolers for the SID chips on a board where the SID socket is located near the bottom edge of the board you won’t be able to use a flat case unless you cut a gap into the keyboard frame. This is a constraint that applies to virtually all stereo SID boards. You may want to consider what kind of pin header to use for the control signals, depending on what mainboard(s) you want to install on and how you plan to control the device. If you are planning to use jumpers or simple switches, a double row pin header may be the best choice, since the lower row conveniently supplies GND. If you plan to interface the control signals from another logic IC or microcontroller you can opt to use a single row pin header to obtain only the control signals instead. If you plan to exclusively install the board on a mainboard where the SID is located in the lower half of the mainboard (250407 or 250469) and in a case were height is an issue, an angled header may be the best choice. Note though that an angled header will prevent you from installing the board in a 250425 or 250466 later on since the board sits very close to the serial connector on these mainboards. Having carefully considered the prerequisites, assembly should be straightforward as only through-hole components are used. However, some care must be taken when soldering the components placed below the SIDs and inside the SID sockets, since soldering them in the wrong order can leave you unable to proceed. You can therefore follow these step-by-step instructions to avoid any pitfalls during build. Please refer to the list of parts and component placement reference below for further information. All resistors are 1/4W. Use metal or precision types. Ceramic/Film Capacitors should be as small as possible. There’s also a shopping cart (excluding the GAL16V8D) from the german supplier Reichelt for further reference. Do not insert SIDs before you have confirmed that the supply voltages are correct. Excessive or missing voltages can easily and permanently damage your SIDs! We first have to make sure that the proper supply voltages are actually present at the SID sockets. The SID is powered by two different supplies, VDD (Pin 28) and VCC (Pin 25). VCC must be +5V for both models, while VDD must be +9V for the 8580 and +12V for the 6581. If either VCC or VDD is missing, or exceeds the required level, the SID may be permanently damaged. Thus the proper supply voltages must be verified for every possible model configuration on both sockets before inserting any SID chips. Begin by removing any jumpers from the board. Make sure the C64 is powered off. Insert the MixSID into the SID socket on the C64 mainboard. If you haven’t done so during build, gently bend any capacitors on the mainboard out of the way. Make sure the board does not produce any shorts with the components below. When using a 250469 mainboard, also connect the supply voltage. Now power on the C64. Verify that +5V are available at the VCC pin. Set the VDD jumper at the corresponding SID model block to the top position (6581). Verify that +12V are available at the VDD pin. Set the VDD jumper to the bottom position (8580). Verify that +9V are available at the VDD pin. If any of these voltages are missing or if they are off by more than 0.5V in either direction it is not safe to insert SID chips into the board. You will have to check your build for mistakes. If all voltages are correct, power down the C64, remove the VDD jumpers and continue with the next section. There are different options to access these signals on the C64 mainboard. The easiest (but least elegant) option is to simply solder a wire directly to the pin of on an IC where the signal is available. Note though that you have to be careful not to apply to much heat to the IC if you do this. Another option is soldering a wire to the respective IC pin at the bottom side of the board and then route the wire around the mainboard edge and to the MixSID. Or you can trace the signal on the board until you find a nice via (hole) where the line changes from the bottom to the top side of the mainboard, and solder in a single pin header. This way you can simply use jumper wires to connect the signal to the MixSID pin header. These signals are only required if you want the secondary SID to optionally also appear at $DE00 and/or $DF00 when using stereo addressing mode. See the description of the IO Enable control signals. If you don’t know whether or not you need this option then you probably don’t. On the 250469 board, all required signals are available at conveniently placed vias to the left of the HF-Modulator. These vias are placed in a standard 2.54mm raster, so a single pin header might be inserted here. On a 250469 mainboard, the pin labeled VEXT must be connected to a voltage source of at least +15VDC. About +20VDC are available the cathode lead of the rectifier diode CR3 on the mainboard and can be safely used for this purpose. You can either solder a wire at the top side of the mainboard, directly to the cathode lead of CR3, or you can solder a wire from the bottom side of the board. When choosing to solder to the cathode lead, make sure that it really is the cathode, i.e. the lead close to the ring printed on the diode body, as depicted in the photo below. Just like the audio output of the C64 mainboard, the audio output of the MixSID board is a line-out signal that must be properly amplified. Connect it to the line input of your stereo system or a headphone amplifier. Do not connect headphones or speakers directly, as low impedance loads such as these will effectively short the output circuit and may possibly destroy it. To ease configuration there is an interactive configuration tool showing how to set the jumpers for mainboard type, the SID model configuration and the audio-in options. The effects of the runtime control signals are demonstrated as well. Nevertheless, all options and control signals are also described in detail in the following sections. On NEW mainboards, a voltage of at least 15V DC must be supplied to the VEXT pin. See Power supply on 25469. All four jumpers must be set either in the top or bottom position. in the top position for a 6581.
in the bottom position for a 8580. The VDD header routes the supply voltage to the SID. In the top position, +12V are applied. In the bottom position, +9V are applied. The FC1 and FC2 headers route the SIDs filter capacitor pins to either 470pF capacitors in the top position, or 22nF capacitors in the bottom position. Finally, the R8 header controls whether or not the output circuit includes an additional 1k resistor to ground immediately at the SID audio output pin. This corresponds to the R8 resistor mentioned in the schematics for the 250469 mainboard. In the top position, R8 is included in the output circuit. In the bottom position, R8 is excluded. The fifth header labeled EXIN in the SID configuration block routes the SIDs EXTIN Input (Pin 26). In the top position, EXTIN is routed to an on-board audio input circuit identical to the circuit on the mainboard (100k, 100nF) and ends up at the top pin of the corresponding NR header. If the EXIN jumper is set to the top position, the top pin of the corresponding NR header can be used as an audio input in a similar manner as the audio input pin at the A/V connector. If the NR pin header is bridged using a jumper, this input is grounded, which is equivalent to the most common noise reduction method of grounding the audio input at the A/V connector. Note though that the effect of this measure may be less noticeable than usual, since there are shorter lines involved to begin with. If the EXIN jumper is set in the bottom position, the EXTIN pin will be connected to ground via a fixed resistor of 220k and a 1M trimmer in series. This allows safely boosting the volume of digital samples played via $D418 for the 8580, which is usually very quiet. Using the trimmer the balance between samples and regular SID voices can be adjusted. Finally the EXIN header can also be left open, which is the equivalent of simply bending the EXTIN pin out of the socket. This is sometimes recommended as an alternative noise reduction method, but is also often advised against. I’ve personally found this measure to be of little or no effect. You can optionally route audio outputs to the mainboard audio out circuit, so that sound will additionally be available at the mainboard A/V connector and the composite video output. There are two additional resistor slots on the board, above the diode at the 7812 regulator. On the renderings on this page a 4-pin socket strip is inserted at this spot. If you leave these slots open, no signal is routed to the mainboards audio output circuit. If you bridge the left slot, the audio signal of SID2 is used. If you bridge the right slot, the output of SID1 is used. Never bridge both slots at the same time, as this would pitch both outputs against each other, probably resulting in damage to either SID. If you want to mix down both signals to mono, you can do so by inserting evenly dimensioned resistors in both slots. 1k or greater is recommended here. Note though that by this measure you will introduce some crosstalk between the audio signals, meaning that the output of SID1 will also be slightly audible in the output of SID2, and vice versa. This will also affect the signals at the board’s own stereo output. So if you want both signals to stay pure you should simply skip this option. All runtime control signals are pulled up to logic HIGH when not connected. They can either be left unconnected (HIGH) or connected to GND (LOW), or they can be actively driven by another logic IC/microprocessor. In addition, all signals are applied directly and can freely be changed at runtime without crashing the machine. The top row contains the actual signals while all pins on the bottom row are connected to GND. This mode should be used when playing back normal SID tunes expecting just one SID at $D400. Both SIDs are addressed in parallel at $D400 and will thus both play the same tune. The Mixer Control can be used to decide which audio output you wish to listen to. The secondary SID is forced write-only while the primary SID remains read-write. Thus only the primary SID will respond to read requests to the readable SID registers POTX, POTY, OSC3 and ENV3. This way paddles and mice as well as sound effects based on reading OSC3 or ENV3 will work as usual. If you install SIDs that differ in sound (either a 8580 and a 6581, or two 6581 with audible differences) and listen to each SID on a different stereo channel while playing a simple mono tune you will notice a stereo effect that results from these differences. Whether or not this sounds good will mostly depend on the tune itself. This mode can be used when playing back tunes explicitly created for two SID chips. When in stereo addressing mode, the primary SID will be addressed at $d400 while the secondary SID will be addressed at both $D420 and $D500 simultaneously. Most stereo tunes expect the second SID at one of these two addresses. If the IO Enable signals are used, the secondary SID will may additionally be addressed at $DE00 and/or $DF00. While few tunes expect the second SID at these addresses, some hardware extensions want the second SID there. The Priority Select signal controls which SID is the primary SID at $d400. In stereo addressing mode the chip select signals (CS1 and CS2) are generated using a combination of the chip select signal for the SID generated by the PLA (CS) and the address bus lines A5 and A8. CS is asserted by the PLA if the address on the bus is between $D400 and $D7FF. CS1 is asserted if CS is asserted and neither A5 nor A8 are high (NOR). CS2 is asserted if CS is asserted and A5 or A8 are high (OR). This is implemented in the GAL Logic. The priority select signal controls which SID takes the role of primary SID and which SID takes the role of the secondary SID. The primary SID will always be read-write at $D400. The secondary SID will be write-only at $D400 in parallel addressing mode and read-write at the stereo addresses in stereo addressing mode. See Mode Select for details. If the signal is HIGH, the SID in the right socket (labeled SID1) will be the primary SID. If the signal is LOW, the SID in the left socket (labeled SID2) will be the primary SID. A common method for detecting the model of the installed SID from within a C64 program involves reading the OSC3 and ENV3 registers. Since only the primary SID will respond to read requests, the priority selection also controls which SID model is detected by software in a mixed setup. The POTX and POTY lines will always be routed to the primary SID, which will then measure and report the current paddle position to the software reading the POTX and POTY registers. The actual values measured by the SID depend on the value of the capacitors externally connected to the POTX and POTY lines. Since different values where used on different mainboards (depending on the SID model usually used on that mainboard), the measurements will be slightly off if a SID model is used as the primary SID that is not native to the board. For example, when using a 8580 as the primary SID on a 250407 mainboard, the values read from the paddle will be off by about 5%. However, this hardly matters in practice since the complete range of values can still be reached by turning the paddle knob. This is only a problem if the middle position of the paddle absolutely has to yield a value of 127. In this case, use at least one SID model native to your mainboard and set it to be the primary SID when using paddles. If the mainboard signals I/O1 or I/O2 are connected to the board, the I1E and I2E signals control whether or not the secondary SID also appears at the corresponding stereo addresses $DE00 or $DF00 when in stereo addressing mode (MS=LOW). This feature allows the user to permanently connect the I/O signal lines to the board but still control at runtime whether or not they are used for stereo mode. Thus if both signals are not connected, the output of the SID in the left socket is routed to the left audio channel and the output of the SID in the right socket is routed to the right audio channel.